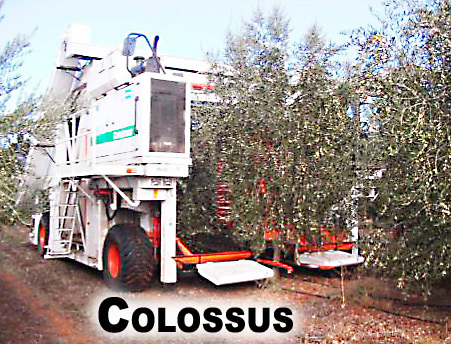 Mechanical olive harvest has undergone a very rapid evolution in just the last 10-12 years. 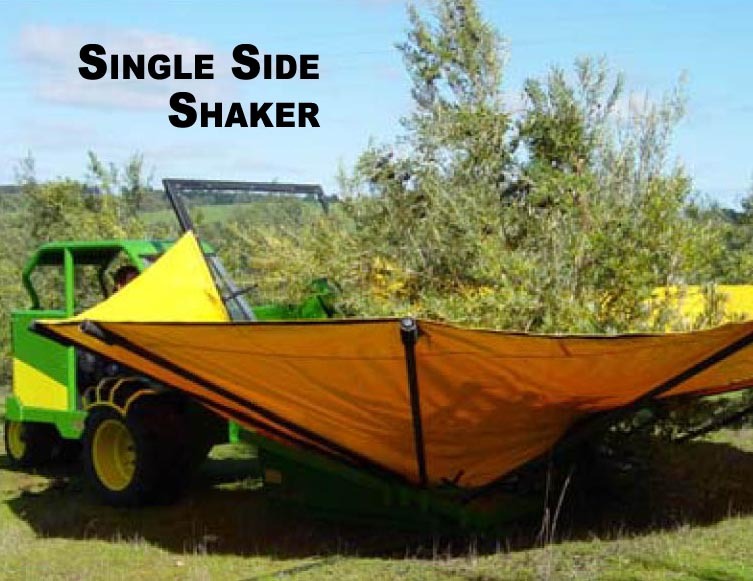 Tree shakers were first used in "Intensive" orchards starting in 1960s, this was followed by the "Intensive Integral" Colosus and concurrently with lateral hedge harvesters. 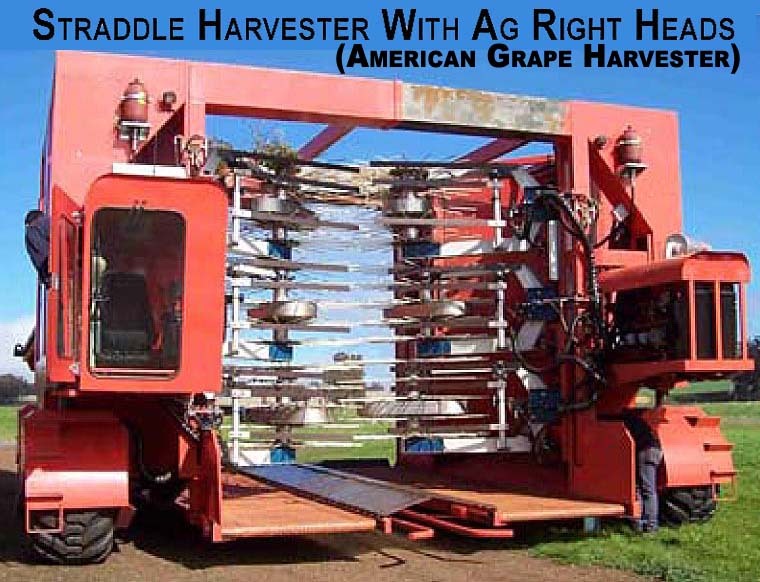 Starting in the late 1990s people began to appreciate the possibilities continuous "straddle" harvesters and began adapting grape harvesters for this purpose. Super-High-Density or Hedgerow(up 1,600 trees per hectare) orchards evolved concurrently with "Straddle" harvesters. These orchards require certian varietals (Arbosana, Arbequina and Koroneiki) and are discussed on our Super-High-Density page. See captioned photos for examples of these different types of mechanical harvesting systems. Produce various types of orchard machinery. 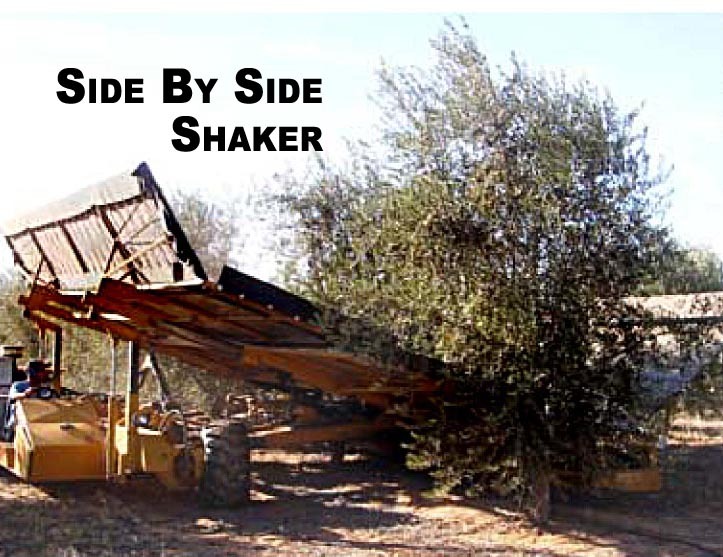 Their main equipment for olives are the mechanical harvesters "Shock Wave Shakers", the "Catchall V & VI" harvest umbrellas and their patented "Magnum Mono Boom" and "Side Mount Sprint" for carefully grasping the trunks. All are thoroughly researched and widely used in olive orchards around the world. 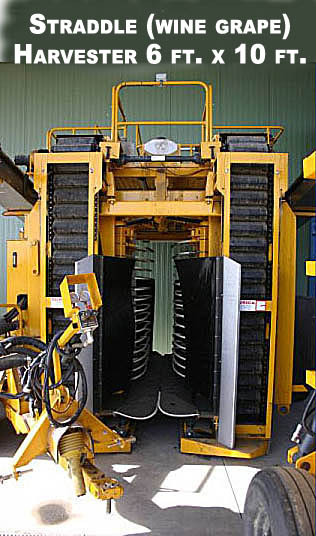 A manufacture of straddle grape harvesters, Gregorie machines are widely used in Australia. 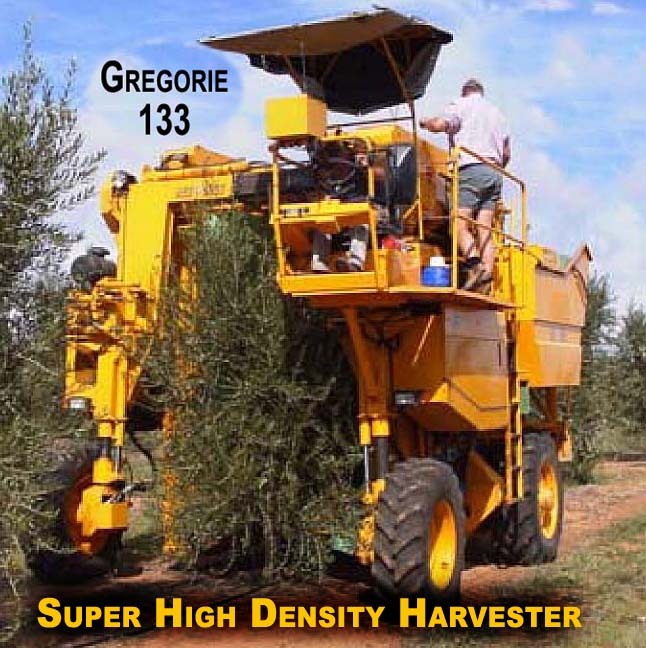 The Gregorie G9 is suitable for olives and comes equipped with a Deutz 6 cylinder engine with 167 Hp. 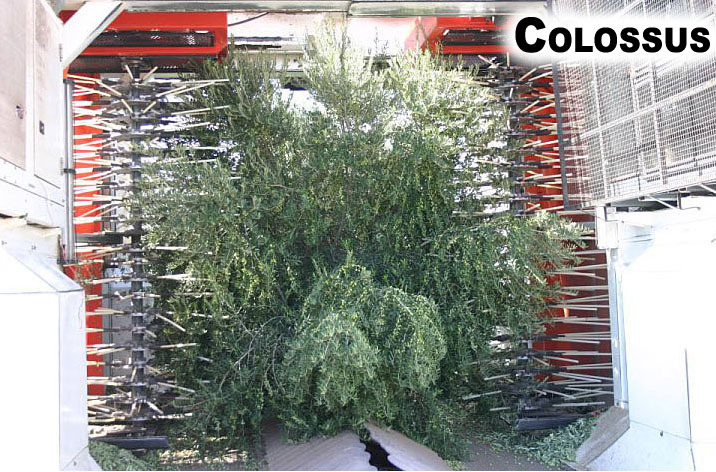 The catcher tray length is 10.4 ft. together with its wide picking head for wide trellis systems. Built specifically for use in countries like Spain, California and Australia. This machine is powerful enough and has the wide setting picking tunnel, well suited for the harvest of the new Super High Density olives. The exclusive VariWidh picking head makes this harvester good to use in standard and wide vineyards or in high density olive plantations. - A new approach leapfrogging existing solutions that have been adopted from grape harvesting (shakers) and are not suited for ripe crop harvesting; besides, they impose pruning restrictions to allow for the use of mechanical equipment. - Flexible delivery the fruit on the side, at the front of the machine or over the row. The videos on the MaqTech website are very impressive! A well known manufacture of grape harvesting equipment. They also sell olive harvesting equipment, although none of these units were represented on their website. Korvan, the best-selling grape harvesters in the U.S., also manufactures harvesters for the berry, citrus, olive, and coffee industries. 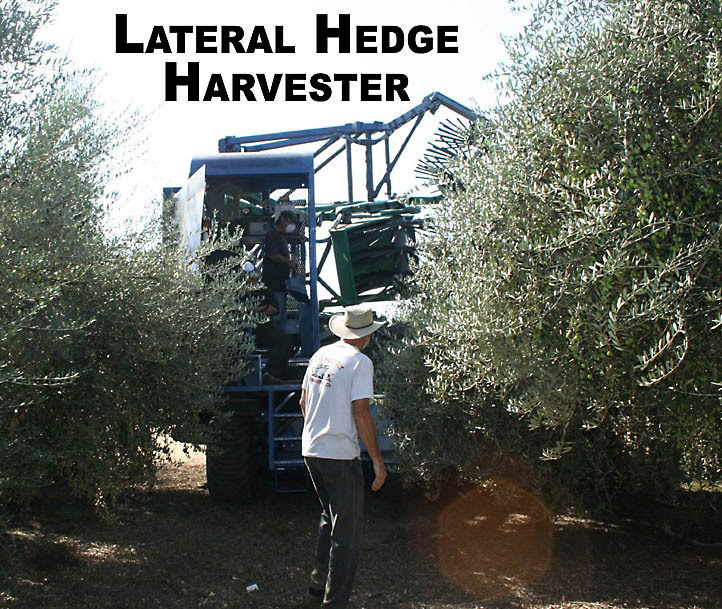 Their current model for olives, the Korvan 5000, is a lateral hedge harvester with three independently movable heads which requires 2 operators. Pellenc America, Inc. offers sales, service and training on most of the Pellenc's full line of self propelled, multifunction tractors, trimmers, pre-pruner, wire-lifters, sprayers, mechanical weeders, portable electric pruning shears, tying machines and more.